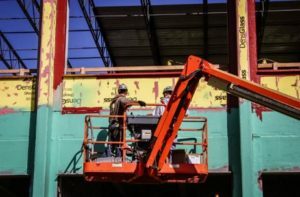 Prosoco R-Guard | Salmon Bay Sand & Gravel Co.
R-Guard air barrier systems stop air leakage through wall structures, rough openings, sheathing seams, and material transitions making your building air tight. And an air tight building is an energy efficient building. That’s why buildings that meet the world’s toughest energy efficiency requirements use R-Guard. The Bullitt Center in Seattle, considered the world’s greenest commercial building, selected R-Guard for it’s air and water barrier system. 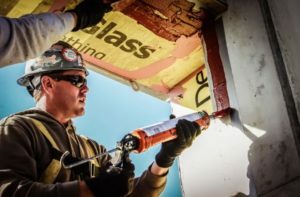 Cat 5 is a single component, Silyl-Terminated-Polymer (STP) that is roller applied to produce a highly durable, seamless, elastomeric weatherproofing membrane on exterior sheathing. Cat 5 is proven to prevent water and air penetration of the building envelope in conditions ranging from everyday weather to the drenching rains and 155 mph winds of a Category 5 hurricane. Cat 5 Rain Screen is a roller applied air and waterproof barrier that produces a highly durable, seamless, elastomeric weatherproof membrane on exterior sheathing behind open-jointed or vented rain screen cladding. Cat 5 Rain Screen is a roller applied air and waterproof barrier that produces a highly durable, seamless, elastomeric weatherproof membrane on exterior sheathing behind open-jointed or vented rain screen cladding. 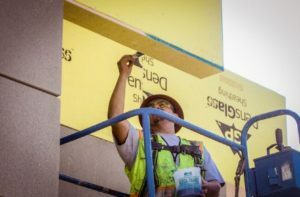 FastFlash is a waterproofing, adhesive and detailing compound that combines the best characteristics of silicone and polyurethane. This single-component, Silyl-Terminated Polymer (STP) is easy to gun, spread-and-tool, or roller apply to produce a highly durable, seamless, elastomeric flashing membrane. 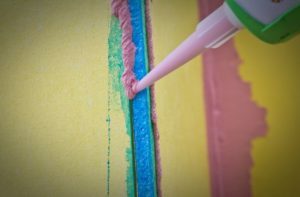 Joint & Seam Filler is a gun grade, crack and joint filler, adhesive and detailing compound that combines the best of silicone and polyurethane properties. This single-component, fiber-reinforced, Silyl-Terminated-Polymer (STP) is easy to gun, spread and tool. 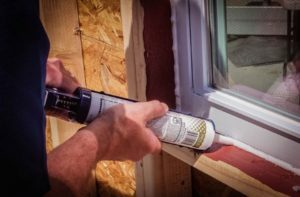 Installed as the interior air sealant, R-Guard AirDam creates a long lasting, weather-tight seal that prevents moist outside air from entering, and conditioned indoor air from escaping around window and door assemblies. This ensures that wind driven rain and condensed water are diverted to the flashing membrane and the water resistive barrier before it can enter the living space. R-Guard PorousPrep seals the dry, cut edges of gypsum wall boards exposed in rough openings for windows and doors. The sealed edge makes a perfect surface for easy application of R-Guard Joint & Seam Filler or R-Guard FastFlash®. 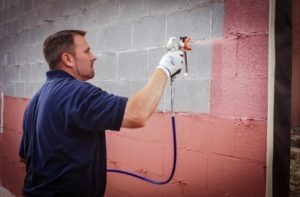 PROSOCO R-Guard® Spray Wrap MVP is a fluid-applied air and water-resistive barrier that stops air and water leakage in cavity wall, masonry veneer construction, as well as in stucco, EIFS and most other building wall assemblies. Once on the substrate, the easily applied liquid quickly dries into a rubberized, highly durable, water-resistant, vapor-permeable membrane. 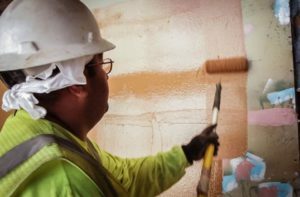 PROSOCO R-Guard® VB is a fluid-applied air and water-resistive barrier that stops air and water leakage in cavity wall, masonry veneer construction, as well as in stucco, EIFS and most other building wall assemblies. Once on the substrate, the easily applied liquid quickly dries into a rubberized, highly-durable, water-resistant membrane. R-Guard VB performs the function of both a vapor barrier and an air and water resistive barrier. 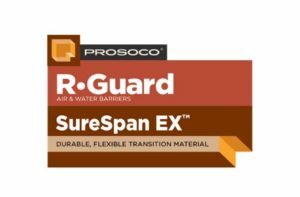 R-Guard SureSpan EX® is a flexible, durable silicone material designed to help create flexible and durable transitions between various types of air and water barriers and the curtainwall, storefront, or window being installed. SureSpan EX® provides a continuous bridge between the window and/or curtainwall openings and the adjacent air and vapor barrier materials.